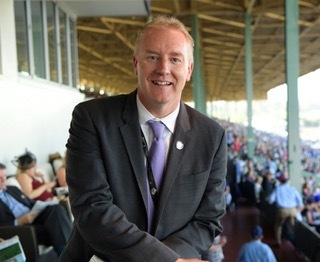 Mike Rogers is President of The Stronach Group`s Racing Division, one of North America`s leading horse racetrack operators and suppliers of pari-mutuel technology. Mike started his career in the horse racing industry more than 27 years ago. In the early days, he held various positions including hot walker, groom and jockey’s valet. He later became a licensed owner and breeder of thoroughbreds and in 1996, became a sports agent representing jockeys in Canada and the United States. In 1998, Mike joined Adena Springs as Business Manager and for the past 18 years has been actively involved in the thoroughbred operations of owner and breeder, Frank Stronach. Mike also commits his time to serving on numerous industry boards and committees including the Breeders’ Cup, Equibase, the National Thoroughbred Racing Association (NTRA), Thoroughbred Aftercare Alliance (TAA), Thoroughbred Owners and Breeders Association (TOBA), Thoroughbred Racing Associations (TRA), Thoroughbred Racing Protective Bureau (TRPB), Permanently Disabled Jockeys Fund (PDJF) and the Racing Medication and Testing Consortium (RMTC). Mike Rogers is currently a Vice President of the National Museum of Racing and Hall of Fame and is also a member of The Jockey Club of Canada.